Have you checked out our Customizable Designs yet? We have two great reasons for you to consider a Customizable Design for your club or group — a big weekend sale and a BIG giveaway!! 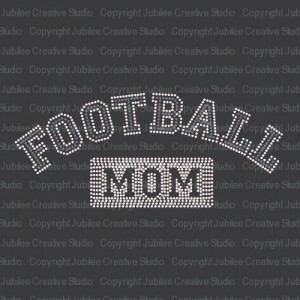 We’re having a special weekend sale on our Customizable Iron On Rhinestone transfers. From now through Sunday (Aug 26th) you can get 20% OFF YOUR CUSTOMIZABLE TRANSFER ORDER! Customizable designs are perfect for schools, churches, businesses, or clubs. Choose your own text and colors (when available)! Remember, you must use the coupon code (CUSTOMLUV) at checkout to get your 20% discount. And please note that there is always a 25 piece minimum order on customizable designs. 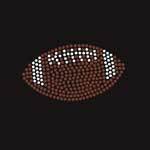 You can choose to receive 25 customized iron on rhinestone transfers made with our Athletic design. You choose the word (maximum 8 characters), and we’ll design it, order it, and ship it to you for FREE. This is definitely the best deal (since it’s free! ), but if the Athletic Customizable design isn’t what you had in mind, then you can choose option #2. You can choose to receive 50% off any other Customizable Design order. There will still be a 25-piece minimum order (and, of course, you’re welcome to order MORE than 25 if you’re ordering for a larger group). I told you it was a big giveaway! Spread the word! If everyone in your school, church, business, club, or group enters then your chance of winning is better! Here are some of my favorite customizable designs but we have many more to choose from! Check them all out and imagine how your group’s name would look in rhinestones! To enter our BIG CUSTOMIZABLE GIVEAWAY, simply leave a comment on this post. Comment entries will be accepted through Thursday, September 6th. That gives you plenty of time to get all your friends/co-workers/teammates to enter the giveaway too! A winner will be randomly selected and notified on Friday, September 7th. New Pumpkin & Snowman Purses ~ GIVEAWAY! New patterns in the Studio! Prepare to receive tons of compliments on your festive Ragged Pumpkin Purse and your Ragged Snowman Purse. Impress everyone when you tell them you made it yourself! The pattern contains instructions for both designs and is available as a print pattern or a digital download pattern. Sew both purses in an afternoon and you’re set for the rest of the year! These bags also make great teacher gifts, hostess gifts, Christmas gifts, or “just because” gifts. Fill the purse with holiday-themed items instead of using a gift basket for a truly unique gift! A fun holiday purse can be carried throughout the season or just to special holiday parties. And once you have this pattern you can easily design new appliques of your own. Sew a flower purse for Spring with our Bright Plaids! A beach themed purse for Summer vacations! Or make it personal by adding an initial to the bag. Grab one of our new Holiday Bag Ragged Homespun Patterns now while they’re on sale and whip up one of these adorable purses for Fall and one for Winter! We also offer separate Pumpkin and Snowan Fabric Kits (pattern + all the fabric you need to make the purse). We’ve made four of these cute bags and would love to give one to YOU! We’ll give away one pumpkin bag now and the other three bags will be given away in the next few months. If you’d like to win a Ragged Pumpkin Purse simply leave a comment on this post by Sunday, August 26th. Are you ready for Fall? Why or why not? Ready or not, the official First Day of Autumn is only a month away! A month is plenty of time to make a Ragged Pumpkin Purse for yourself . . . and maybe one for a friend too! A winner will be randomly selected and notified via email on Monday, August 27th. There’s a new page at the top of this blog titled GIVEAWAY WINNERS. Winners will be listed here using first name and last initial only. We will continue to contact winners via email and will not post a name to the winners page until we have received a reply email. Are you ready for some football bling???!!! We’ve got so many cute football-related iron on transfers! It’s fun to mix-and-match designs to create exactly the look you want. 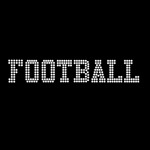 Pair a football design with a mascot image, mascot word, jersey number, or use our sports alphabet to add a name or position to your shirt. You can save 25% on your football bling if you order by August 23rd. Simply use coupon code BACKTOSCHOOL at checkout to receive a 25% discount on your order! See details below! 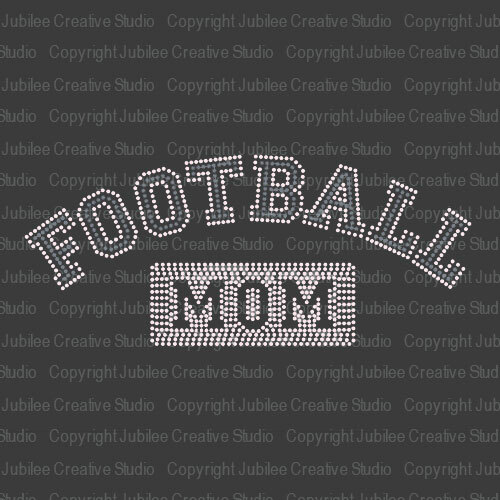 To get your football bling collection started, we’re giving away one of our newest Football Mom designs! Simply leave a comment on this post telling me who you’ll be rooting for this Fall and you could win! Comment entries accepted through Sunday, Aug 12th and a winner will be randomly selected and notified on Aug 13th. Happy cheering! Go team! One of my favorite Christmas decorations is stockings. I have a set of Christmas stockings that I’ve used for years and I still get giddy when I pull them out of the Christmas decoration box. Do you have a specific Christmas decorating item that you look forward to seeing every year? If you don’t have a set of Christmas stockings that you love, why not make a set to use this year? Homemade Christmas stockings are unique, personal, and make great family heirlooms. And once you have the pattern, it’s easy to add more stockings to the mantle as your family grows! Jubilee Fabric offers six unique Christmas stocking kits. Mix-and-match patterns for a coordinating look or line your mantle with snowman stockings if it’s your favorite design! You can follow the patterns exactly or add initials or other special embellishments to personalize the Christmas stockings for your family. View our selection of Buttons — perfect for adding an extra bit of interest to these Christmas stockings! We’d like to help someone get started on a Christmas stocking project! To wrap up our Christmas in July giveaways we’ll give one blog reader a Christmas stocking starter pack — one print pattern (which includes instructions for all six designs), and two Christmas stocking fabric kits of your choice — a $28 value! Leave a comment on this post to enter. Which Christmas stocking design is your favorite? Comment entries will be accepted through Saturday, August 4. The winner will be randomly selected and notified August 5th via email. It’s giveaway time!! We’re excited to award one blog reader a set of SEVEN Christmas rhinestone transfers! 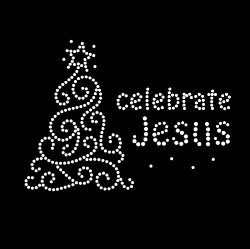 This set includes one Celebrate Jesus Christmas Tree transfer, one Nativity transfer, one Merry Christmas transfer, two small Holly transfers, and two small snowflake transfers. Make yourself a t-shirt, embellish a scarf as a gift for a friend, or use these sparkly iron on transfers to decorate around your home. Christmas and rhinestones are a perfect pair! They go together like a snowy evening and a cup of hot chocolate. Or like a warm fire and a good book. Or like Christmas Eve and a candlelight service. Leave a comment on this post to enter this giveaway. Fill in the blanks with your own idea of how well Christmas and rhinestones go together. Christmas and rhinestones go together like _____ and ______ ! Or you can simply leave a comment with a “Christmas-y” word (Joy, Noel, etc). Comment entries will be accepted through Monday, July 30th. A winner will be randomly selected and notified on July 31st. Patterns are 40% off this week!!! This is a great time to stock up on patterns for all those projects on your To Do list! Besides our selection of Christmas patterns we also have patterns for a Sweetheart Throw (perfect for Valentine’s Day! ), a Stars-n-Stripes Tablecloth (perfect for the 4th of July! ), and a Fancy Flora’s flower quilt (perfect the little girl in your life!). Or you could start your homespun Christmas gifts with our baby bib pattern, Bible cover pattern, little girls’ ragged skirt pattern, or wall hanging pattern. And of course we have Christmas patterns on sale too–Christmas tree skirts, stockings, and throws. I think it’s time for another GIVEAWAY! This week we will give away a set of six Primitive Homespun Christmas Ornaments to one lucky blog reader! These unique ornaments add character and charm to your Christmas tree — or anywhere you choose to display them. View all of the ornaments on our Christmas Products page. To win six Primitive Homespun Christmas Ornaments leave a comment on this blog post. Take a look at the ornaments and tell me which is your favorite ornament shape — if you can choose! Comment entries will be accepted through Sunday, July 22nd. If there’s another Christmas product you’d like to see in a sale or giveaway during our Christmas in July promotions please mention it in your comment. We love making our customers happy! Christmas in July – Tree Skirt Giveaway! It’s that time of year again!!! Time to start planning all those Christmas projects – tree skirts and stockings to decorate your own house and cozy Christmas throws or festive bling to give to friends. Whether you’re after a homespun Christmas or you prefer to celebrate with a lot of bling, Jubilee is here to help you plan ahead. Throughout the month of July we’ll be featuring sales, specials, project ideas, and giveaways on all things Christmas. Giveaways will take place here on the blog but there will be some sales and specials that will only be announced on our facebook pages. To get the most out of our Christmas in July event be sure to check the blog often to see what’s up for grabs and LIKE our Jubilee Fabrics and Jubilee Rhinestones facebook pages! We’re kicking off Christmas in July by GIVING AWAY one of our Ragged Christmas Tree Skirt Kits! These kits include the digital download tree skirt pattern and all the fabric you need to complete the project. These kits are regularly priced at $35.99 but are currently on sale for $29.99 through July 16th. Choose from the bright Holiday fabrics or the softer Primitive fabrics. To enter the giveaway, simply leave a comment on this post telling me your favorite Christmas song. Temps are soaring into the triple digits here in the Midwest but simply listening to Christmas music makes me feel a little bit cooler! Comment entries will be accepted through Sunday, July 8th. 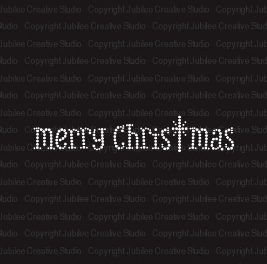 Merry Christmas in July from all of us at Jubilee Creative Studio!! 23 New Fabrics & Charm Pack Giveaway! Summer has officially arrived…and so have new fabrics! 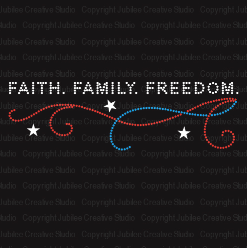 We have 23 new additions to the Jubilee Fabric collection! Whether you’re looking for fun summery colors or inspiration for upcoming Christmas projects, we have plenty of new options to spur your imagination. We’ve also introduced new charm packs for all of our rag quilter enthusiasts! Jubilee now offers a rich Red Delicious Charm Pack, a springy Ginger Blue Charm Pack, and a soft Petal Pink Charm Pack. Each of these packs are available in both 5” and 6” squares. Also, an exciting addition has been added to our popular Bright Plaids Charm Pack family. We’ve added a new 4” pack to compliment the 5” and 6” packs we already offer. To celebrate all of these fun new arrivals in the studio, it’s time for another giveaway! How about one of our new 4” Bright Plaids Charm Pack bursting with color? To enter, simply check out our new arrivals then leave us a comment on this post with your project ideas inspired by any of our new arrivals. Leave your comments through next Thursday, July 5th. On Friday, July 6th, we’ll announce the winner! Congratulations to Melissa V. and Cindy K., our randomly selected winners of the Jubilee Photo Contest! 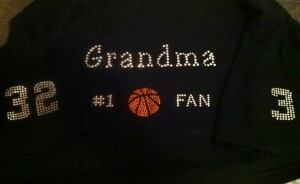 Melissa submitted a photo of a t-shirt blinged with several of our sports iron on rhinestone transfers that she made for her mom. 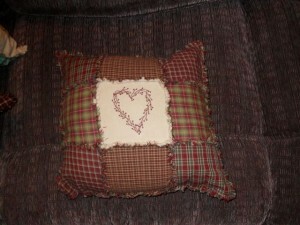 Cindy sent us a picture of a throw pillow made with Jubilee homespun fabric. You can view all of Cindy’s products at her online store, primStitch. We had such great submissions to our photo contest that we decided to award a 2nd place “viewer’s choice” award in each category. The rhinestone photo submission that gets the most LIKES on our Jubilee Rhinestones facebook page and the fabric photo submission that gets the most LIKES on our Jubilee Fabric facebook page will each receive a $15 gift certificate to the store. The last day to LIKE a photo and cast your vote is May 31. Click on the links above to go to our facebook pages and vote for your favorite photo! Also, congratulations to Amanda D. for winning the Faith. Family. Freedom. iron on transfer! She’s set for all of those 4th of July activities now! And finally, there’s still a short time to enter our Big Bridal Bling Giveaway! 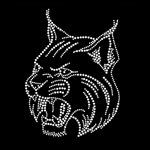 Twelve iron on rhinestone transfers worth almost $50!! Whether you’re getting married next month or next year or know someone else getting married this giveaway is a great deal. Enter the giveaway by leaving a comment on the Big Bridal Bling Giveaway blog post. May 31st is the last day to enter so don’t delay! Our next giveaway a for our Jubilee Fabric fans! Stay tuned for a fantastic giveaway just in time for Independence Day! Something old, something new, something borrowed, and something bling! Ok, so that’s not how the saying goes but what’s a wedding without a little bling?? Attention brides! We’ve got a fantastic giveaway for you! 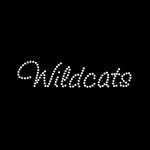 You can win TWELVE of our bridal iron on rhinestone transfers to completely bling out your wedding party! This bridal set is almost $50 worth of bling! The winner of this giveaway will receive one each of the Bride, Mother of the Bride, Mother of the Groom, Flower Girl, Maid of Honor, and Just Married designs and three each of the Bridesmaid and Bridal Entourage designs. Use them to make gifts for your wedding party or shirts for everyone to wear to rehearsal, bachelorette parties, or any pre-wedding activities. And, of course, the Just Married design is for you to wear on your honeymoon. Who knows? Your Just Married shirt might get you bumped up to First Class or upgraded to an ocean view room! So, how do you win this amazing Bridal Bling giveaway? 1. Leave a comment on this blog post to enter. 2. Go LIKE our Jubilee Rhinestones facebook page. This isn’t necessary to enter the giveaway but if the winning name is also one of our facebook fans she will receive an additional iron on transfer for a total of 13 designs. 3. Share a link to this giveaway on your own Facebook and/or Twitter account. This is also not necessary to win but you can obtain additional entries for Facebook and/or Twitter shares. Simply leave another comment on this post that says FACEBOOK or TWITTER. You can have a total of three entries in this giveaway: your original comment, a Facebook share comment, and a Twitter share comment. However, the only thing you MUST do to enter the giveaway is leave one comment on this post. The winner will be selected randomly once the entry period closes. Entries will be accepted through Thursday, May 31. And this giveaway isn’t just for brides. If you know someone getting married then go ahead and enter! What a great gift this set would be!